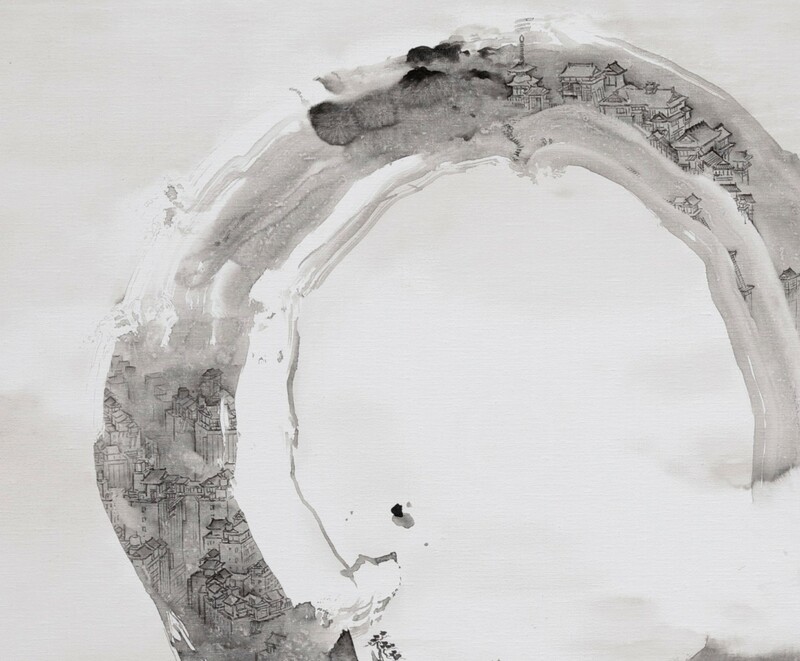 The Daiwa Anglo-Japanese Foundation is delighted to introduce the work of the renowned Japanese painter Akira Yamaguchi to the UK public. The works exhibited here present Yamaguchi’s attempt to resolve the contradiction of being a painter inheriting the legacy of classical Japanese art, but also trained at art school to follow Western (oil-based) painting techniques. 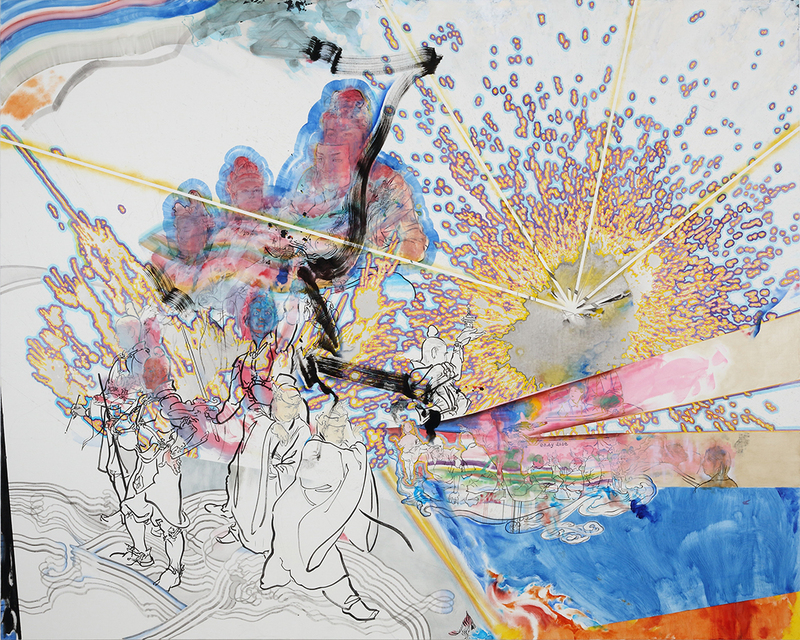 Yamaguchi’s works combine the unusual sense of perspective of fukinuki-yatai (a particular perspective used in Heian-period scrolls) or the bird’s-eye view of traditional Japanese painting with elements of modem and contemporary architecture, obtaining an almost cinematographic effect of movement across planes. The works exhibited present a new development within Yamaguchi’s practice. In some of his work, Yamaguchi has been influenced by the Kano school painters of the Muromachi period. They developed a painting technique using gold paint to create a perception of depth revealed under a reflective light; different from the expansive depth produced by gold-leafed surfaces. Yamaguchi wanted to create the same visual effect, but by using oil paint instead. He used linseed oil as it is almost transparent when painted. When creating or looking at paintings, Yamaguchi usually does so from an angle where the reflecting light does not come into his line of sight. However, in this case, the painting relies on the reflection of light to be seen. In his work, he paints not the motif itself, but the empty spaces; objects appear in areas missing oil paint. The artwork’s motifs are thereby visible or invisible depending upon how the light catches them and on the viewer’s position. It also gestures toward a singular quality of classical Japanese painting, which was that it was intended to be viewed from multiple angles, as opposed to Western painting which traditionally accommodated one frontal-facing viewpoint. Simultaneously engaged with classical legacy and contemporary expression, experimenting with different media and questioning the cultural significance of “oil on canvas”, Yamaguchi’s works urge the viewer to reconsider arbitrary boundaries within art history, while inviting us to contemplate the visible and invisible “resonances” of painting.